Halloween is brewing around here! Here's one of the finished skirts with the shirt to go with it. 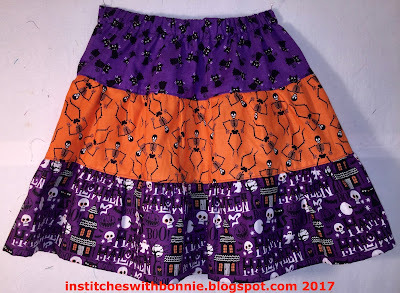 I was quite pleased to find this cute little skeleton to go with the skeletons on the middle tier of the skirt. Unfortunately, I got the shirts (navy blue shown here for Ellie while Natalie's is black) before I decided to make the skirts. I'm sure no one will care. 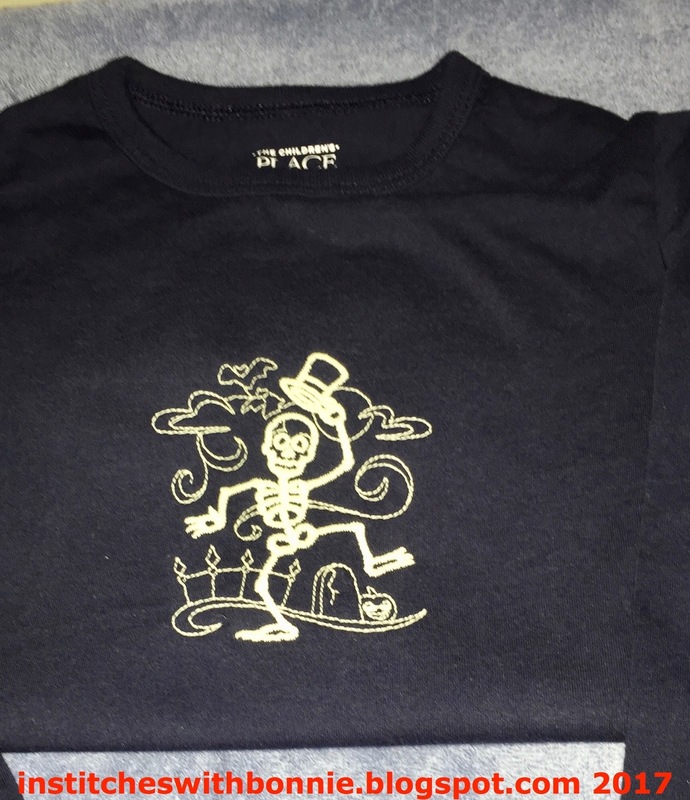 To add pizzazz to the shirt design I got some glow-in-the-dark thread. It is pretty cool. (On the other hand it seemed ridiculously expensive.) Hopefully I can do the other 2 shirts for the girls with it. Theo got a bright orange. You notice something odd in this picture? Yep, I'm missing one block. 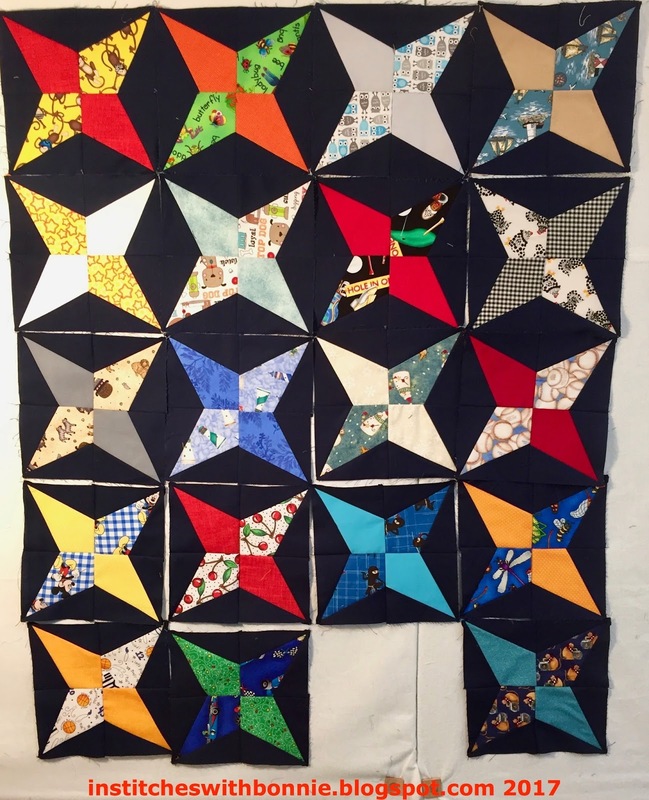 I was at the community quilt gathering stitching away on these blocks and ran out of the kite shapes. UGH. I guess I don't count so well! I'll cut out one more pair and get them sewn up so I can start on the borders. This is my OMG for October and it is half over already. Yikes. Have you finished your October One Monthly Goal? So my weekly goals were somewhat successful. Cut out and piece star quilt√ -1 – oops! Here's what's going to be done by next week... hopefully. Everything except the kite block and binding needs to be ready to take to Ellie and Theo's birthday celebration on Saturday. Good thing I can sew fast! That's it for me today. I need to get sewing to get all this done and presents wrapped by Saturday! I'm linking up with my regular linky parties: Oh Scrap!, Monday Making, Main Crush Monday, and Moving It Forward. Take some time to see what folks are doing these days by visiting these linky parties. Enjoy. 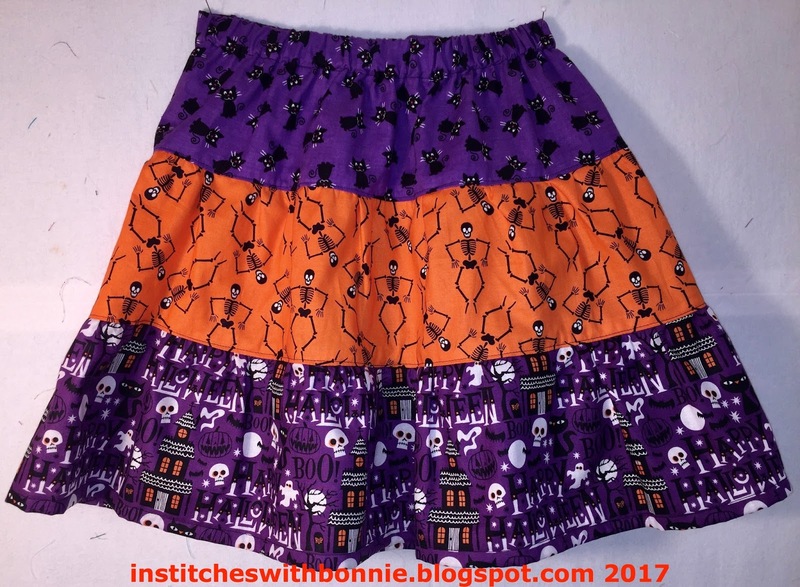 The skirts are so dang cute with the shirt - they will love them. I still need to make a backing for the QOV that I finished recently. It was put on hold while I went to my sister's and played with lots of yarn. 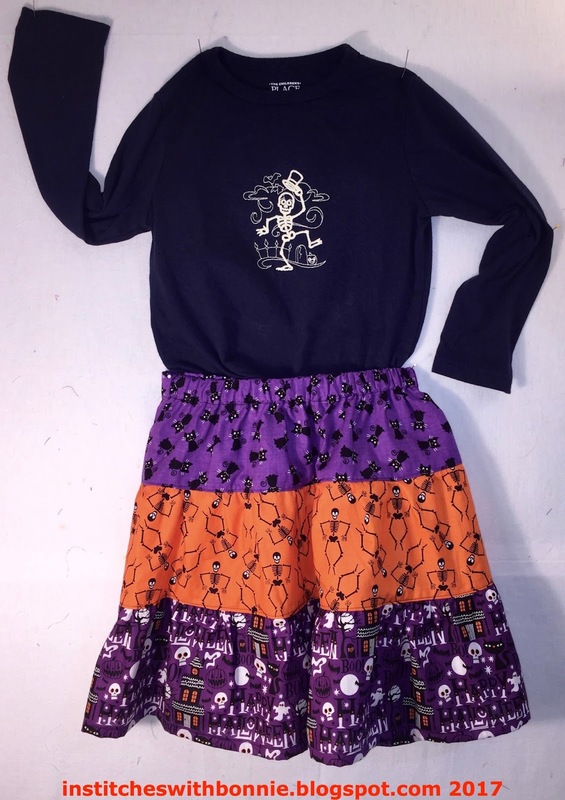 The skirts and tees are so cute! Aren't those stars the ones you took to retreat and couldn't work on? "Ad astra per aspera" ("to the stars through hardships")! So cute, Bonnie. What a great tradition. Love that skeleton T, very fun. The skirt is so cute. She'll be very well dressed for any Halloween parties.